One of my themes for this summer is to learn about the traditional ways of living in these rural places where I’m fortunate to spend my time. For when Dan and I get to build our little self-designed cob or strawbale house (and I say “when” rather than “if” because anything is possible if you believe in it enough, right? ), we want to incorporate as many time-tested features for down-to-earth, resilient living as possible. So I’m on a mission to see how our ancestors did it. 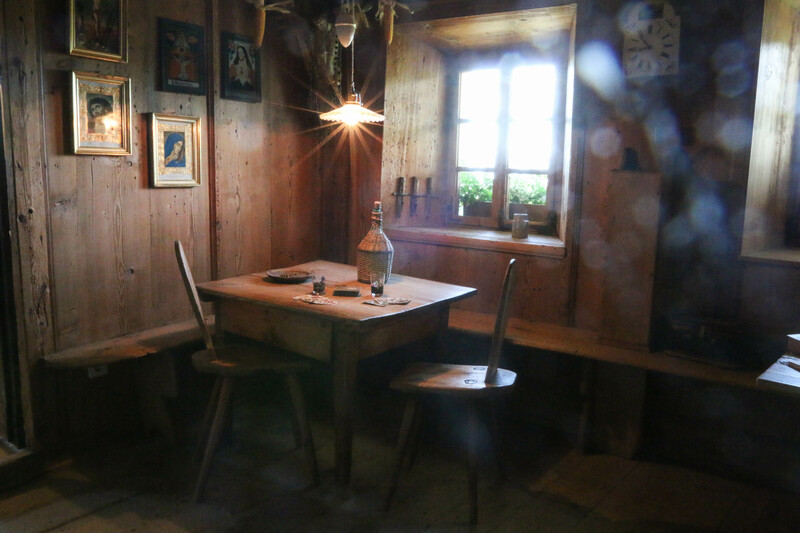 No better place to start than the country houses on this mountain, where people survived demanding conditions: cold snowy winters and physical isolation on the mountain, which required a hefty dose of self-sufficiency and can-do attitude. 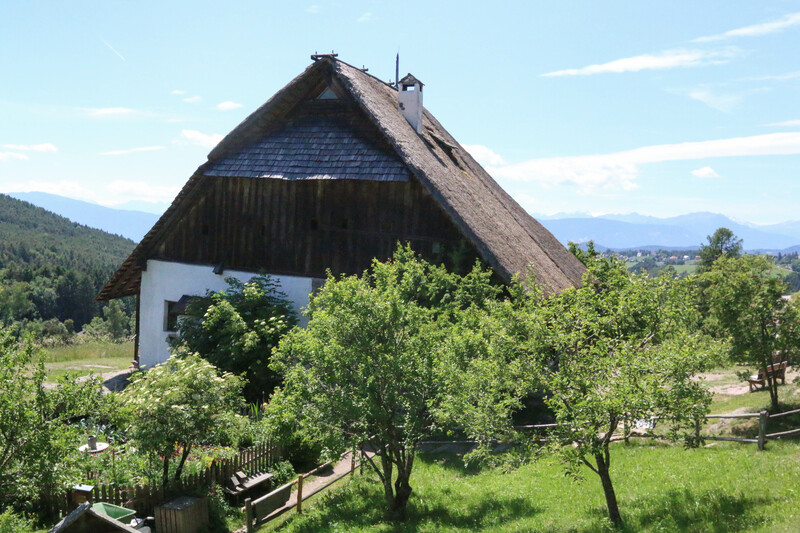 The oldest house still standing on the mountain — at least 500 years old — is the traditional farmhouse that now houses the Plattner Bee Museum. I’d been there once before, and remembered the beautiful thatched roof proudly peaking on a hill above the village of Wolfsgruben. But I remembered little about the house itself — apparently, I was too focused on sampling the different-flavored honeys and smelling the honey and beeswax soaps. Now it was time for another visit. Until 1975, the last remaining members of the family — two strong, wiry elderly sisters — lived here, with no electricity or running water. They grew barley, rye and buckwheat and once a week made the trip barefoot to the nearest city to sell vegetables. The house is preserved as it was then, so it’s an excellent showcase of simple subsistence living on a mountain. 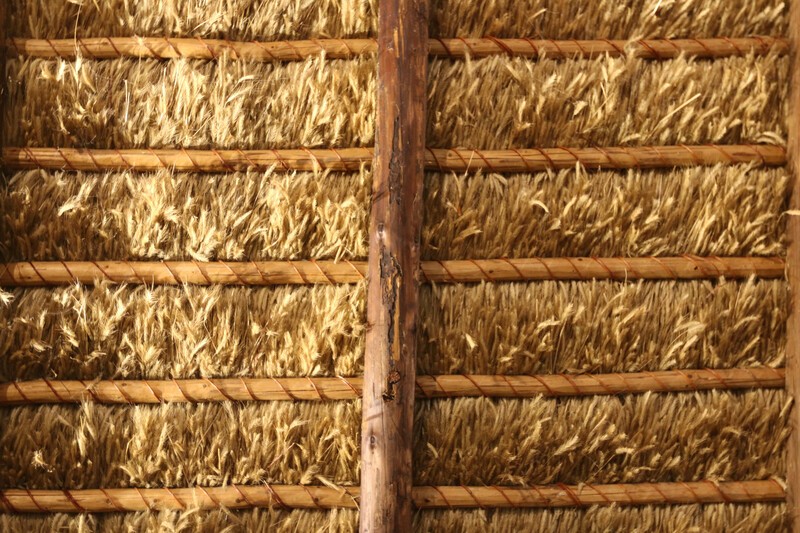 The house still has a traditional thatched roof made of rye straw, complemented with larch shingles. 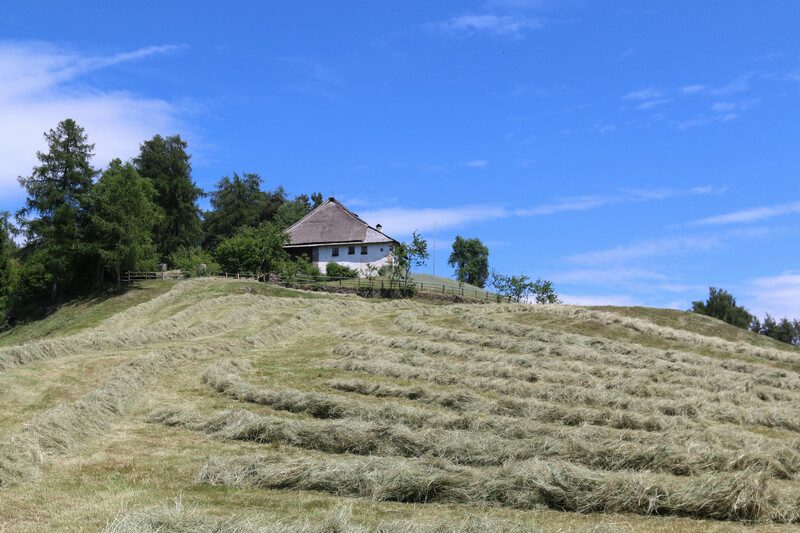 It doesn’t get much more local than that: the rye straw was from the house’s own fields, and the larch shingles from the larches that line the path up the hill. I imagine the stones for the stone walls were also dug up from the surrounding fields. I guess that would be the No. 1 house design tip if you built a house on a mountainside in the year 1500: keep your materials local. 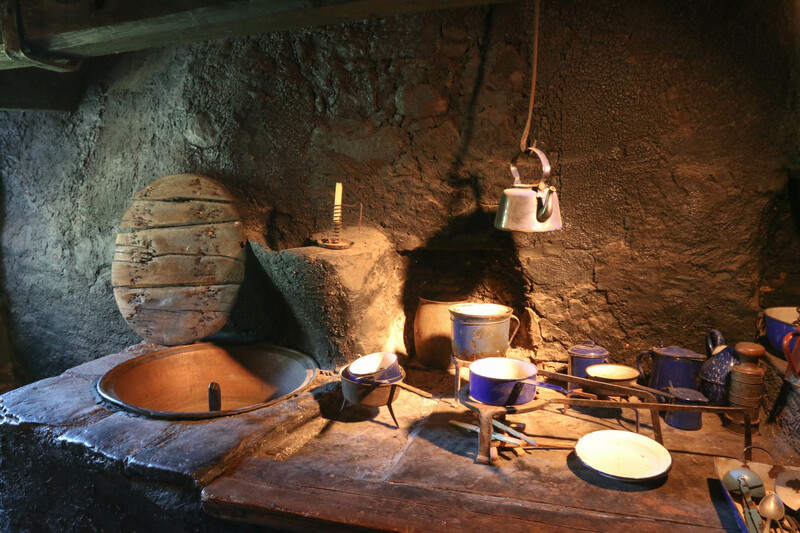 How did the inhabitants keep warm in the winter? 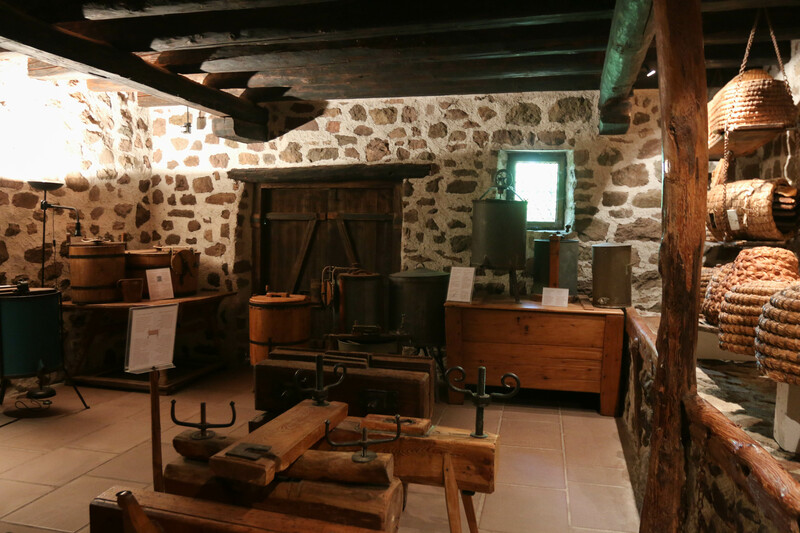 First of all, here, as in traditional houses in many cultures, animals were kept on the bottom floor (where beekeeping implements are now on display). People lived on the second floor, benefiting from the warmth generated by the bodies of the animals, which rose upwards. Also, notice the small windows to minimize loss of heat. A second tip for keeping warm is spending most of the indoor time in the winters in the one room which could be heated, the Stube. It has a masonry oven, a beehive-shaped mound of bricks, which stores heat incredibly well and releases it slowly through the night. 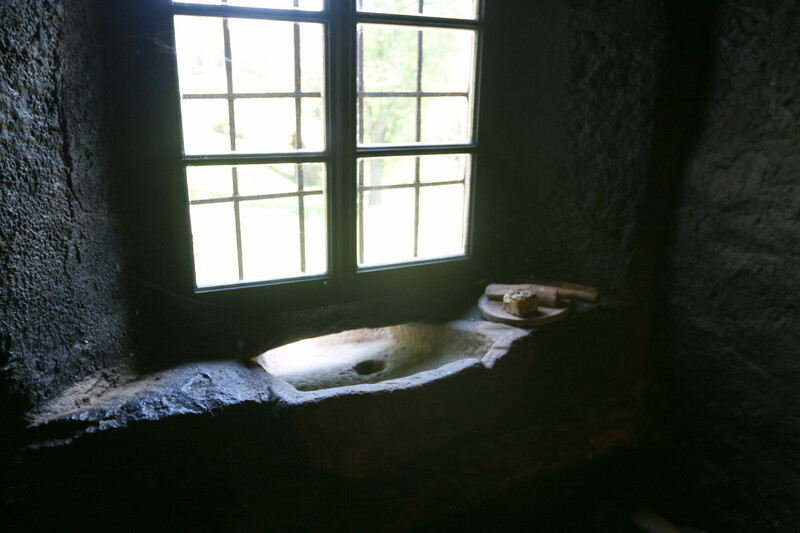 A wide shelf was built above the masonry oven — surely the coziest spot in the house on cold winter days and nights! The fire was fed from outside in the hallway, so there would be no smoke coming into the Stube. The hallway, on the other hand, was so smoky that the walls are still pitch black — but this was on purpose, as that’s where meat was smoked and cured. 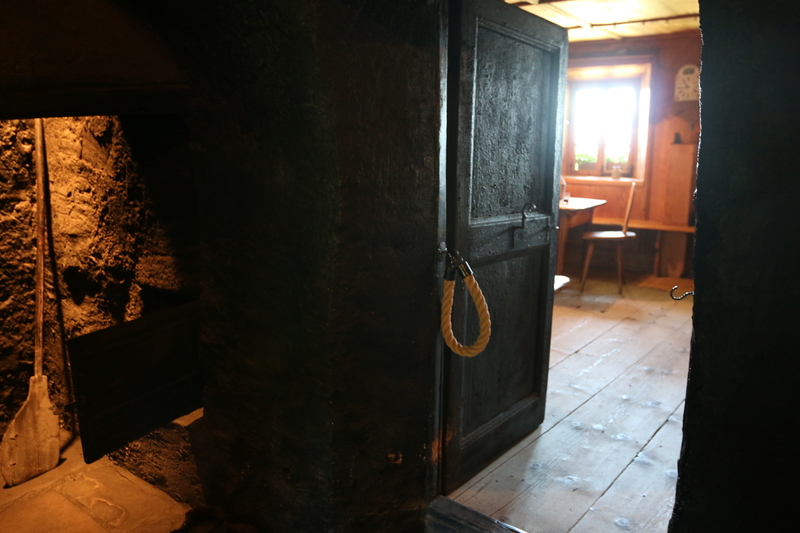 In the warmth of the Stube, the evenings were spent working on crafts, such as spinning wool and twisting rope (below). The kitchen, across the hallway, was wood-heated, of course. It has one of the most ingenious waste management systems I’ve seen: a chute underneath a window, which allows discarding compost waste directly onto the compost pile underneath — or possibly for the pigs which were kept directly below this window. Cooking water went the same way, down a little dent in the chute. No need for trash bins or compost hauling trips! 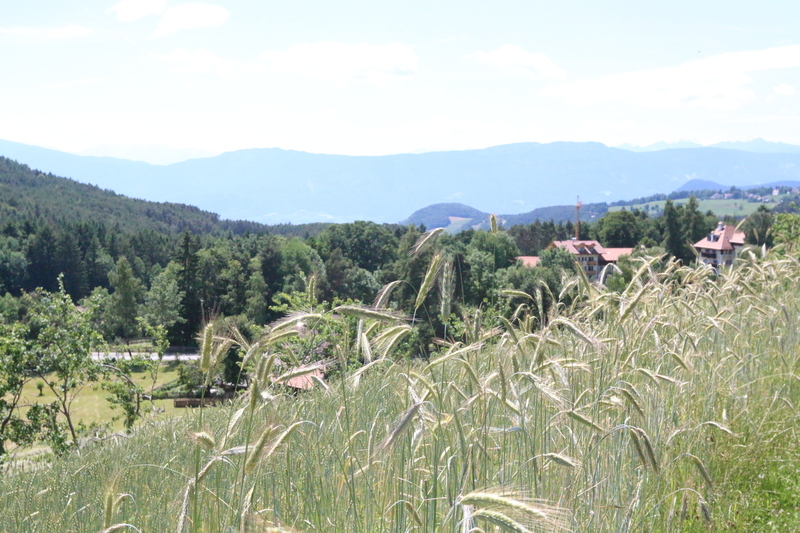 What’s remarkable about these mountains of South Tirol is that much of the farming is still done using traditional methods and manual labor, because many of the mountainside fields are simply too steep for large machinery. 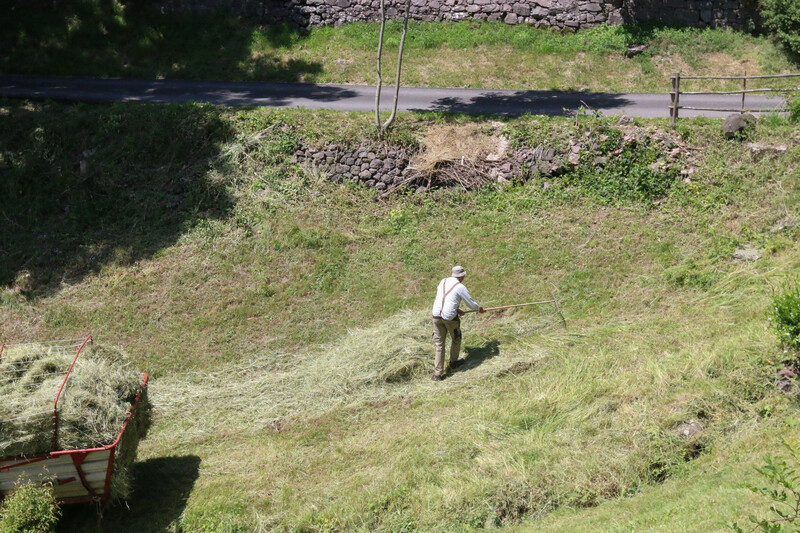 Over these weeks of June, we’ve seen so many farmers, wearing their traditional blue aprons, cutting and bundling hay for their animals with scythes and rakes. Oh yes, and the house is now a bee museum. There were bees. And honey. And lots of learning about traditional beekeeping methods. More about that next time! Great post! Love it! Thanks!